Your duas might not be answered by Allah Almighty because of your sins. 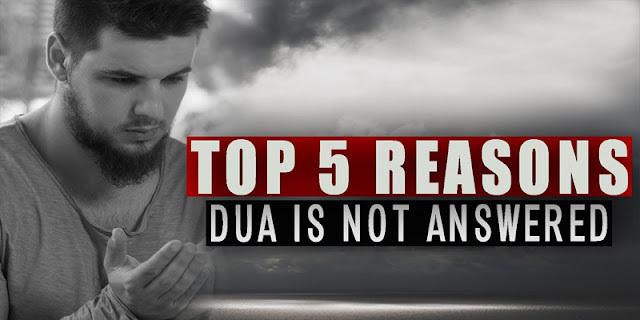 As we know one of the things that causes our duas to not be accepted by Allah, not be answered by Allah is our sins. An example, that the Prophet have mentioned in Sahih Muslim, is an example of a person whose sustenance, their earning, isn’t halal, and that’s one of the reasons why their duas are not being answered. You might be asking for something which is haram, something which is impermissible. So for example, if you’re making du’a to go to Vegas or something to gamble, it may be that Allah is protecting you from that sin and that’s why Allah is not answering your dua. Allah knows that what you’re asking for is not actually good for you. So you may think that this thing or whatever it is that you’re asking for is good for you, but Allah knows that it’s not good for you. An example of that would be, let’s say, you’re making du’a to get married to a particular person, you say: “O Allah, please let me marry so and so”, but Allah knows that you marrying this person is not a good idea, naturally be harmful for you, and it would cause you a lot of pain and suffering in your life, and for that reason Allah doesn’t answer this dua. Allah has something better in store for you in the Akhirah (hereafter), meaning it’s possible that Allah doesn’t grant you something in this life because He wants to reward you for it in the Hereafter with something which is way better. It may be that your dua is not that it’s not being answered; it’s just that the answer from Allah is delayed. And Allah may delay answering the dua for a few reasons. For example, Allah knows that by making this dua, or by consistently making dua to Allah, you’re actually getting closer to Allah, and Allah wants you to continue to get closer to Him, by continuing to ask Him. When Allah loves someone, He will test them. So, by you going through this pain and suffering, and you not finding this relief, it may be that this is a test from Allah, and therefore, you are getting closer to Allah.